Painting your cabinets doesn’t have to be difficult, especially when you pick the best paint for the job! One of my most popular posts lately has been How to Paint Your Kitchen Cabinets Without Sanding, so it got me to thinking of all my blogger friends who have painted their wooden kitchen cabinets over the years. Deciding what type of paint to choose when embarking on painting your cabinets can be daunting. There’s several options that will yield really great results. Of course, which paint you choose depends on the type of cabinets you have, their current condition and how durable a finish you want. Let’s see what some of my blogger friends have used to paint their cabinets, shall we? Which paint is best for your cabinets will depend on a few factors, so let’s delve into each of these paint types. In terms of purchasing traditional paint for your cabinets, there’s two products that you will need to purchase: a primer and then actual paint. From my experience, professional painters will strongly recommend either going the oil based route (cons: smelly & messy, long cure time) or using an alkyd paint like Benjamin Moore’s Advance Waterborne Alkyd Paint, available in both a primer and paint that act like oil-based without the stink or clean-up. 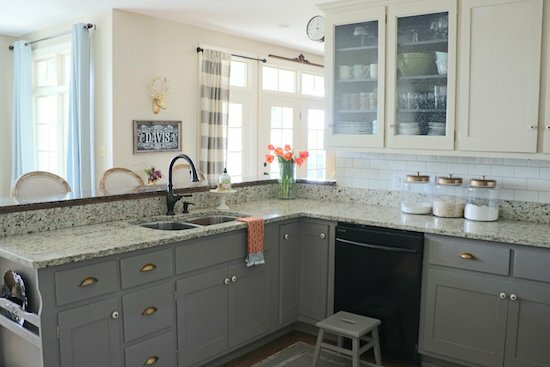 Below you can see how Laura from Inspiration For Moms painted her kitchen cabinets with Benjamin Moore’s Advance line and used a sprayer to get amazing coverage. If you’re comfortable using one, a sprayer really gives a smooth, flawless finish. This is also something you can get done professionally and relatively inexpensively compared to the cost of brand new cabinets. Diane from In my Own Style opted to use the Sherwin Williams Alkyd formula and can testify that it has excellent adhesion abilities, flow and leveling to lessen the look of roller and brush marks as well as the fact that it is non-yellowing (which is super important if you’re painting your cabinets white). Diane also talks about the importance of using a stain blocking primer, especially when you are dealing with older wood cabinets that may have tannins that will eventually bleed through. This has happened me in the past and trust me, it’s not a good look. So whatever paint you decide to use, if your cabinets were previously stained, I you will really want to use a primer first. If your cabinets have been previously painted using a oil-based paint but you want to paint with latex, try using a paint additive like Oil Bond. I’ve personally used it and it has really impressed me. By wiping it over your cabinets, it works as a deglosser (so no sanding required!) and by adding it to latex paint, it allows the paint to correctly adhere to a previous oil-based surface. My favorite way to use it? Use the Oil Bond to degloss and then use Hard Coat (by the same company) as an additive in your paint. It creates a rock-hard finish that ensures your cabinets won’t chip or peel. When you’re painting something that is opened and closed (and kicked and scuffed) several times a day, the last thing you want is peeling and chipping paint! You can read more about Oil Bond here and and then check out how I painted my doors using Hard Coat. My friend, Carrie, from Lovely Etc. did an amazing job painting her oak kitchen cabinets using an enamel-based paint along with a stain blocking primer. She’s a perfectionist by nature, so I can assure you that the finished product is beautiful. Not only have her cabinets held up really well but she also figured out a trick to hide that unsightly grain! Enamel based paints are known to give a rock-hard finish and while Carrie used Deco-Art, a traditional enamel based paint like Sherwin William ProClassic® Interior Acrylic Latex Enamel paint, which is mostly used as an interior trim paint, is another excellent choice for a really durable finish. Source: Lovely Etc. Head over to Carrie’s blog, read her entire process and decide if enamel-based paint is the right one for your kitchen cabinets! Tasha from Designer Trapped in a Lawyer’s Body successfully painted her oak cabinets with milk paint, without sanding or priming (but she did de-gloss) and they are not only beautiful, but holding up perfectly several years later. She used a high quality Milk Paint followed by a very durable top coat – all the details and brands are contained in her blog post. Tasha has several posts that will walk you through her process as well as a video that shows how her cabinets are holding up several years later. Like Carrie, she also had the issue with the wood grain in oak cabinets so be sure to read the comments in her posts to see what she decided to do! If a matte finish is what you’re after, using a chalk-style paint might also be an option for your cabinets. Chalk paint adheres remarkably well and as long as it is sealed correctly (don’t use wax in a kitchen! ), it should last well. I’ve personally only painted furniture using chalk paint – and everything has held up perfectly – but I cannot attest to whether it will eventually chip or flake. Saying this, many bloggers love their Chalk Painted Kitchen Cabinets and the paint seems to be holding up very well. Full disclosure, I’ve used Velvet Finishes many times in the past and I’ve loved it. I’ve painted a dresser, rocking chair and my coffee table and the paint has never chipped or flaked off any of them. But I’ve never painted a kitchen cabinet. My friend, Jenna from Rain on a Tin Roof went as far as to use Velvet Finishes paint on her kitchen cabinets. She didn’t sand or prime, but did use the line’s deglosser. She has since sold that home, but said they held up really well! I know my coffee table has stuff throw on it and we always rest our feet on it and it has NEVER even scuffed so I can definitely personally recommend this paint line! See the full before and after as well as Jenna’s process over on her blog. Absolutely! For cabinets, doors and trim a satin finish gives a more modern look. If you cabinets are older, using a satin sheen instead of a semi-gloss will also help to downplay any imperfections in the wood. So which product should you choose to paint your cabinets? Now you have several options to help you decide what type of paint to use for your kitchen or bathroom cabinets. At the end of the day, if you want a rock-hard surface that doesn’t show brushstrokes or roller marks, the professional level paints, in particular the Alkyds, are probably the best way to go for a long-lasting result. But many people have had success with other products such as milk paint and chalk paint. Whatever type of paint you end up choosing, make sure you research the process used by others. Ensure your cabinets are clean before applying any products, sand and de-gloss if necessary and don’t forget to apply a stain blocking primer. On the other hand, if all of this seems too daunting maybe you should consider other options. If your cabinet boxes are in good shape, cabinet refacing is also an excellent and cost-efficient option to getting the look you want. 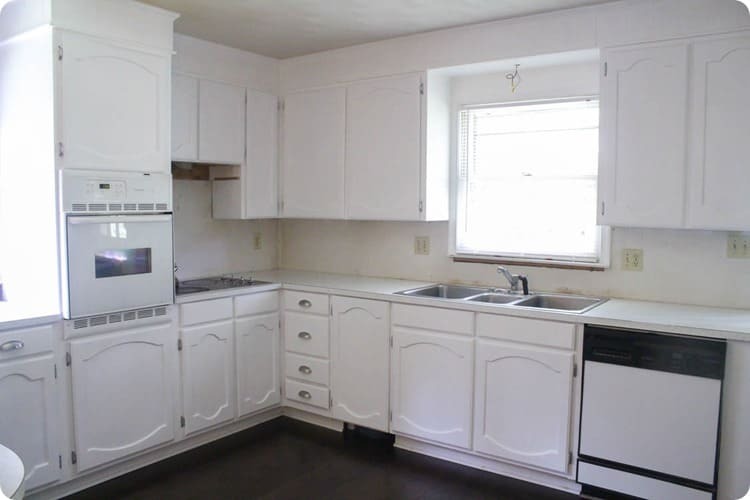 You can read about how we refaced out kitchen cabinets here and see the full before and after. Found this post helpful? Have you found the best paint for painting kitchen cabinets? Then be sure to click the image blow and save this post to Pinterest! Any recommendation on what kind of primer to use on new unpainted cabinet door made of combination of mdf and wood? I’m thinking of using either Sherman Williams ProClassic paint or go the Benjamin Moore advance line. What would you recommend? I just repainted some maple color built in cabinets with Valspar stain blocking blocker and enamel paint and it was a bit of a battle as it seems to still be easily chipped so trying to find a better option for the kitchen. Thanks! I would always use a shellac based primer on unsealed wood. My preference is Zinsser B-I-N Interior Multi-purpose Shellac Wall and Ceiling Primer. It will guarantee that the wood won’t bleed and works amazingly well with the ProClassic or BM Advance line over it. On another note, SW recently came out with a new line of paint – Emerald Urethane Trim Enamel and it works even better on cabinets that the ProClassic so I would consider going that route, too! Hi Kimberly – you have a few options. First, I would make sure they are deglossed and light sandly. I would prime them, too just to be certain. Then – you can either use a latex paint with the hard coat additive OR use an Alkyd paint like BM’s Advanced line. Both will give you excellent results that will dry to a rock hard, chip resistant finish. The hard coat is definitely the cheaper option as BM paint are very price. But it’s up to you! While I have not painted any cabinets in my home with the hard coat, my doors get banged and kicked by my kids ALL the time and still look perfect! You should not have to top it with a polycrylic if they have been painted and allowed to cure correctly. For the scratches, you don’t need to prime, just touch up with the paint. SW Pro Classic Enamal is really good paint that’s used for trim and cabinets all the time so I’m surprised this happened. It seems like it never cured right….did you allow each coat to fully dry before the next? I have read some info on fusion mineral paints have you heard anything about them compared with other hard wear paints? Kim, Fusion Mineral paints are excellent! I’ve recently started using them for painting furniture but I don’t as of yet know anyone who has used them on kitchen cabinets (which are susceptible to grease and needing to be cleaned down).